HomehistoryWas The Dark Countess Really Marie Therese Of France? In 1807, a mysterious couple arrived in Hildburghausen, Germany. The young, blonde-haired woman always wore a veil to cover her face. Her companion, an older man, had an aristocratic air, and acted as her protector. His name, the one scribbled on the letters he received, was Count Vavel de Versay. He was later identified as Dutch diplomat Leonardus Cornelius van der Valck. The woman had no name. Only after her death, the Count referred to her as “Sophie Batta”, a “poor orphan”. But her true identity still remains a mystery. The young woman was soon nicknamed the Dark Countess by the townsfolk. Rumours started spreading that the poor orphan was none other than Marie Therese of France, daughter of the unfortunate Louis XVI and Marie Antoinette, and the only member of her immediate family to have survived the revolution. 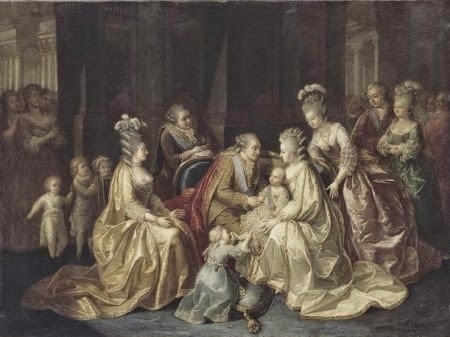 According to this theory, the young princess had been raped and impregnated while in prison, and so was sent to the small German town, while her place next to her uncle, Louis XVIII was taken by her “half-sister” Ernestine, the illegitimate daughter of Louis XVI. What made people think that the Dark Countess and Marie Therese were the same person? For starters, the couple were heard talking in French. Servants at the castle they resided at claimed her laundry was embroidered with the fleur-de-lys, a symbol of the Bourbons. 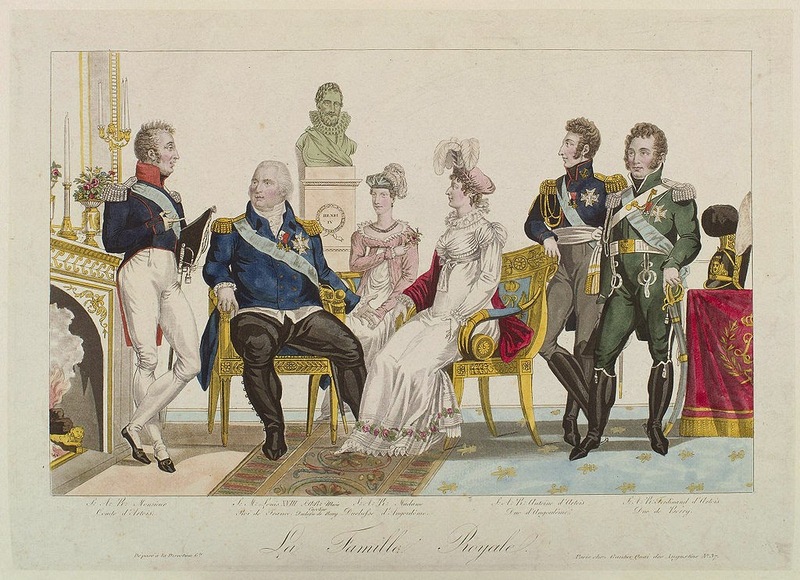 One of them even boasted of catching a glimpse of the countess’ face and recognizing the French princess. And the Marie Therese that was restored to her family after her imprisonment simply wasn’t as pretty and charming as her mother Marie Antoinette had been. So, she had to be an impostor. But was she? 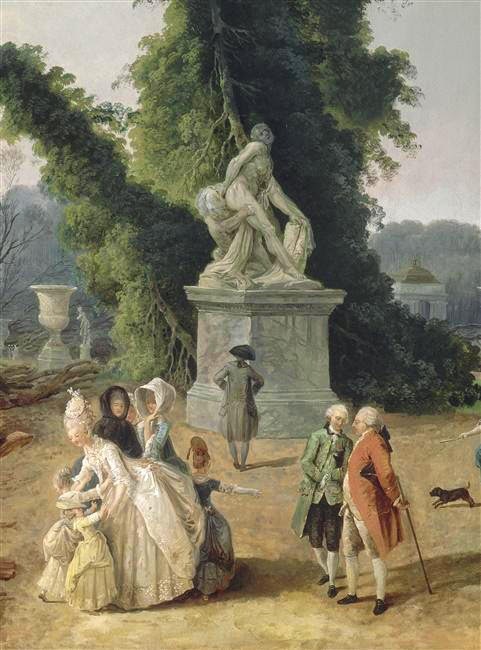 Louis XVI was a deeply pious man, with a high sense of duty and moral standards. He was very devoted both to his Catholic religion and his wife. The idea that such a man would betray his religious beliefs and marriage vows is preposterous. There is no evidence that he was ever unfaithful to his wife, but there is plenty that he rebuffed all his courtiers’ attempts to provide him with mistresses so that, through these women, they could exercise control over matters of governments. 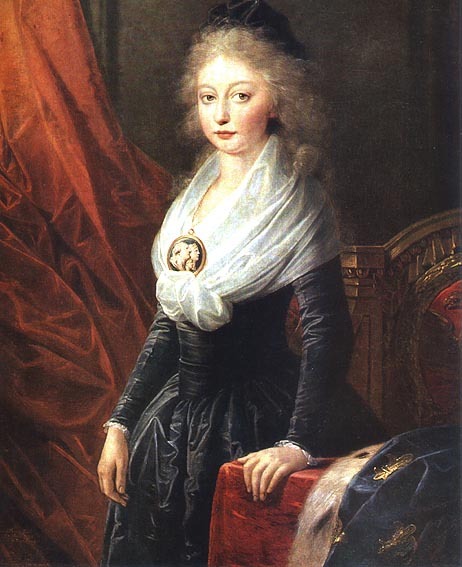 Some historians, such as Dr Nagel, author of Marie-Therese: The Fate Of Marie Antoinette’s Daughter, believe that Louis XVI, curious to find out “who would be at fault if his wife did not conceive”, had an affair with a young chambermaid called Philippine de Lambriquet, and got her pregnant with Ernestine. This theory just doesn’t make sense, and not only because it would have been totally out of character for Louis XVI to have an affair. Philippine was married and, as Nagel herself admitted, because of that “Louis was still not certain of his own fertility”. If you wanted to be sure that you could get a woman pregnant, why would you choose a married one? That totally defies the purpose. Especially because Louis had a virgin wife. Wouldn’t it have made more sense for the King to try and conceive a child with Marie Antoinette and, only if that failed, test who was at fault (although I personally highly doubt that, even in that case, he would have committed adultery)? Once the marriage was consummated, Marie Antoinette conceived fairly quickly, so there was no need to test anything at all. So, who was Ernestine? The child of servants. When her parents died, Marie Antoinette adopted her. 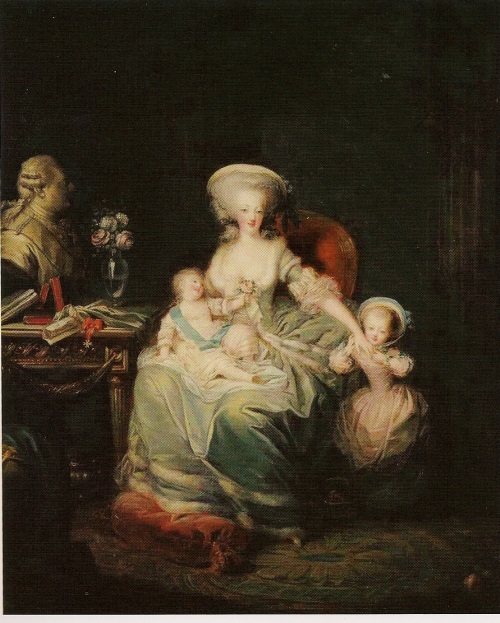 Marie Antoinette loved children, and adopted at least two more. Ernestine and Marie Therese grew up together and were very close, but they weren’t half-sisters. Historical records show that Ernestine married widower Jean-Charles-Germain Prempain in Paris on 7 December 1810. She died in the same city three years later, aged only 35. Therefore, she couldn’t have been the Dark Countess. One of the main reasons why the substitution theory always had many supporters is due to Marie Therese’s sad and morose character and her lack of beauty. A lot of people just couldn’t believe that this broken woman was the daughter of the beautiful and charming Marie Antoinette. But Marie Antoinette and Marie Therese were different people. Just because they were mother and daughter doesn’t mean that Marie Therese had to automatically inherit her Marie Antoinette’s most famous qualities. Most importantly, Marie Antoinette didn’t have to endure imprisonment and the assassinations of all her immediately family during her most formative years (although, had she survived the revolution, she would have been left very scarred too). Marie Antoinette’s life, once she set her dainty little foot in France, certainly wasn’t easy, but it wasn’t, until the revolution broke out, even overly traumatic. Marie Therese was barely a teenager when her family was imprisoned. One by one, she saw all the members of her family taken away by the revolutionaries, never to see them again. She had to endure all sorts of deprivations, insults and abuse. We know now that experiencing traumatic events like this as a child or adolescent can, according to scientific studies, cause changes in the brain. Marie Therese, after her release, showed signs of post traumatic stress disorder, whose symptoms include anxiety attacks, memory problems (blocking out certain events resulting in incongruities in the victims’ own stories) and avoidance of certain people and places (she never liked being in a crowd and always avoided passing by the site where her parents were guillotined). Although PTSD wasn’t known at the time (at least not with this name), a lot of people who had gone through harrowing experiences suffered from it. That such events left scars difficult or impossible to heal would hardly have surprised anyone. What’s surprising, then but especially now, is that people still expected Marie Therese to grow up into a lively and gay woman. In the past, people may have believed that you could simply grow out of it, but now we know it just doesn’t work that way. So, why is this still used as “proof” of the substitution? To successfully pull off the substitution, Ernestine would have had to be an amazing actress. Apparently, she fooled all the members of the Bourbon family and loyal friends and supporters who had known the real Marie Therese since birth, as well as everyone else who had met the princess. For no one to question her identity, she must have never slipped up or made a mistake. That’s highly unlikely. And if someone suspected something, why didn’t they say anything? Were they bought off? With what money? After the Revolution, the Bourbons spent many years in exile, living off other people’s charity. And what political purpose would this charade have served anyway? In 2013, the body of Sophie Batta was exhumed so that DNA tests could be carried out. The mysterious woman has since then been reburied, but I couldn’t find any information on whether the tests were performed and, if so, with what results. I hope that, when they will be made public, we can finally put this myth to rest forever.